Recently I was asked if I go to exhibitions and to shows (like the ‘Festival of Quilts’, mentioned in my last post) to get ideas. I was quite taken aback by the question. I replied at the time that I thought the answer was ‘no’ because I was fizzing with ideas, but it made me stop and think about ideas and about how they develop before crystallising into the making of a final piece. Last night was the Private View for the forthcoming exhibition in the Bishop Auckland Art Gallery, entitled ‘Cutting Edge’, which opens today. The exhibition includes four new pieces of my work, made specifically for the exhibition. I used patchwork techniques (because they involve cutting up pieces of fabric before joining them) and raw edge applique (where zig-zag stitches are placed over a cut edge, to hold the fabric down. The next one I made was ‘Hope’. This definitely has a concrete source of inspiration, because we have a set of letters H, O, P and E propped up on one of our windowsills. They were purchased during a very bleak period when the word represented a statement of intent, more than anything else. 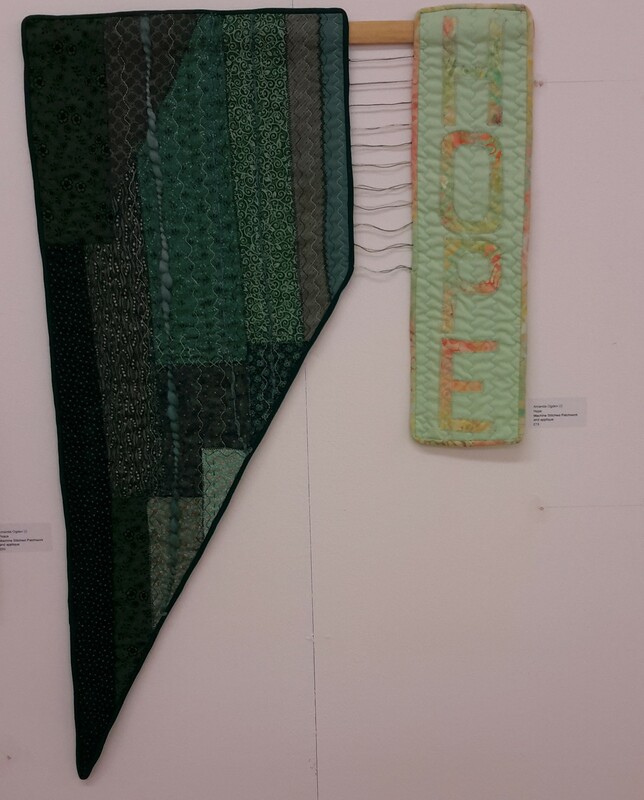 The letters are red-painted metal, whereas the stitched piece needed to be shades of green, I felt, darker on one side and light around the word ‘HOPE’. 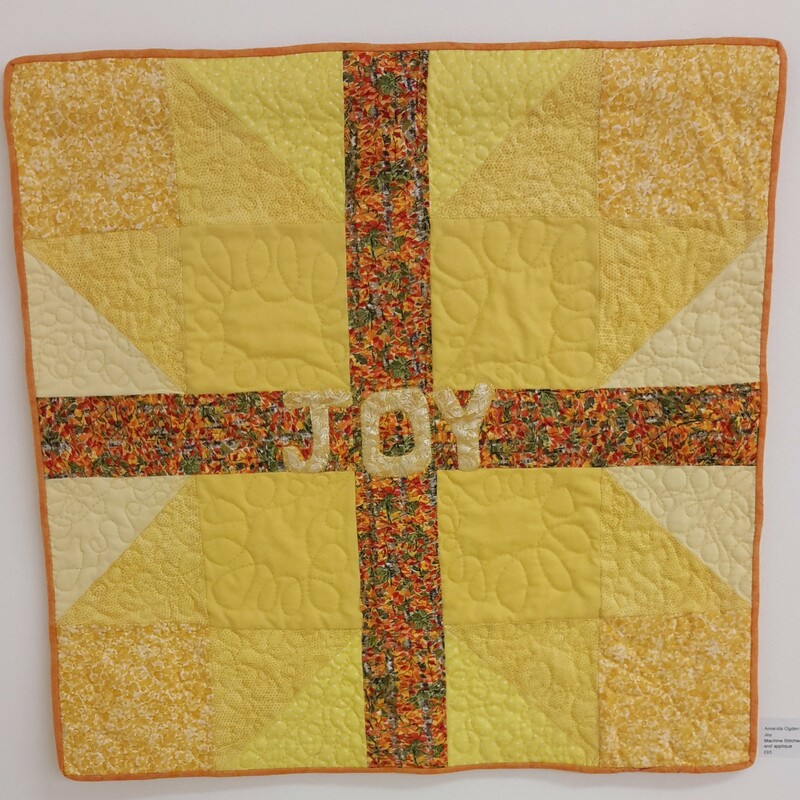 The letters themselves are cut from a ‘batik’ fabric where warm orange tones are mixed with greens: the fabric was a gift from Kate, a member of my quilt group, who brought it back from America. 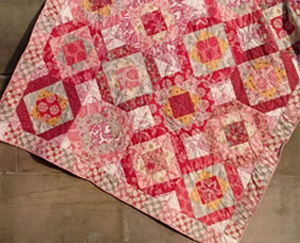 The darker part is patched with pieces of fabric of various sizes and shapes, there is machine stitching, machine quilting, couching and hand embroidery, to suggest the complexities of life. There are thin threads joining the two parts together in order to suggest that holding on by a thread is enough. Next came ‘Joy’ which just had to be yellow. 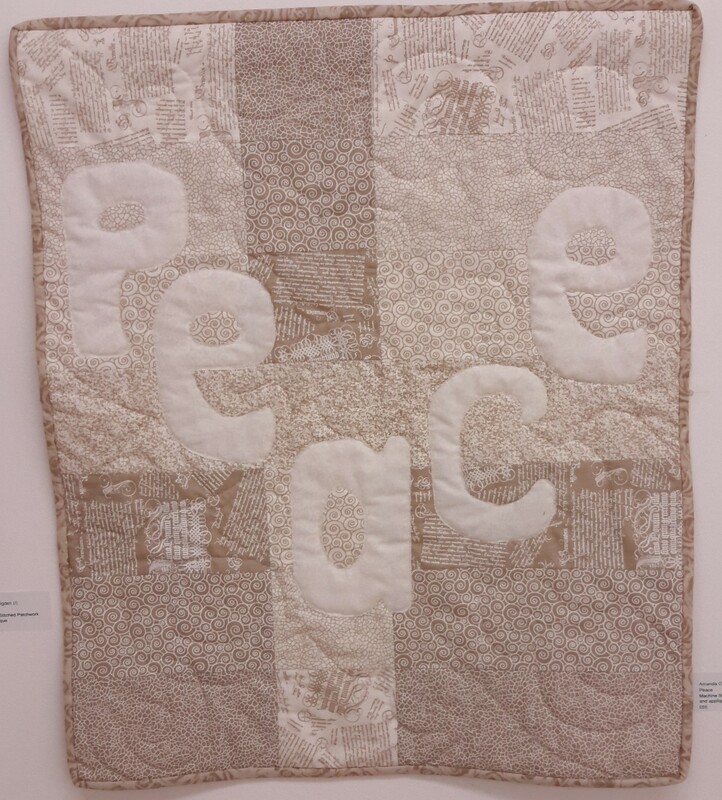 In this one the letters remain quite small, so the colours can speak more strongly, and the pattern of the quilting flows out from the centre. 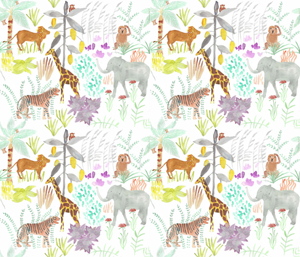 Joy is definitely different in quality to ‘happiness’ and I want to suggest that it can emerge in the face of complexity, hence the very busy pattern in the strips through the centre in each direction. ‘Love’ was the last one to be made. 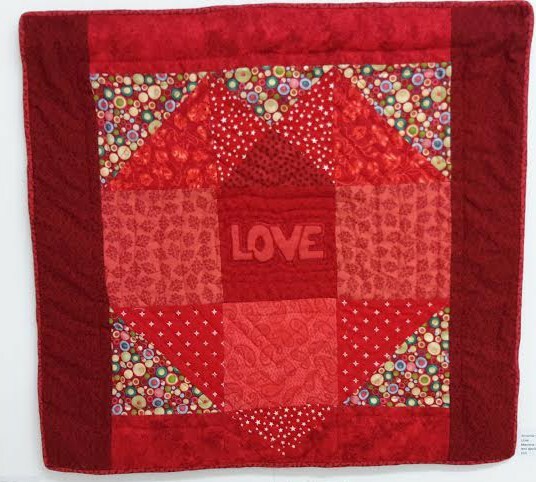 Technically, it followed the same path as a version of a heart shape that I made previously in a commissioned wedding quilt, so cutting the shapes came quite easily. The fabric choices were more difficult and I did lots of choosing and discarding, using the basket of fabric pieces rather like a palette full of paints. It did need to be red, but I didn’t want it to be schmaltzy. This is about love as a decision, about choosing to love and about remaining strong, steadfast and faithful. All four of these were sketched quickly with pencil drawings in my sketchbook and then made very intensively over a period of six (long) days. I went straight to the finished product, rather than producing samples or a maquette, and I was changing and adapting as I went along. The four finished pieces were very close to those first quick sketches.